See the history page of the USAF Drum & Bugle Corps and Pipe Band Alumni web site for a summary of the history of bagpipes in the USAF. According to the USAF Drum & Bugle Corps and Pipe Band Alumni web site, the "Lady Jane" tartan was designed in 1988 for a particular customer named Jane. Strathmore named the tartan “Lady Jane of St. Cirus” after the customer and a small settlement north of Montrose, because Strathmore had made skirts for the customer, as she was particularly fond of the tartan. A gentleman named Robert Kulyn, the owner of the Tartan House in Tipp City, Ohio, introduced the tartan to USAFR band members, and since the tartan was an “orphan”, the band decided to “adopt” it as their own. The tartan was also selected by Major General James MacAdoo, Vice Commander of the USAF Reserve, who reportedly said it “symbolized the citizen airmen of the Air Force Reserve." This tartan is owned by Strathmore Woollens. They weave it in 11.5oz/yard material. 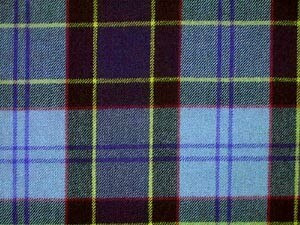 The U.S. Air Force has not yet formally adopted this tartan.